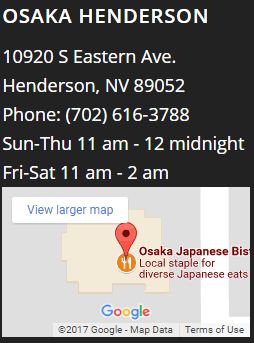 Osaka Japanese Bistro has been part of the Las Vegas food scene for over 50 years. And, all that time, we haven’t offered an “all you can eat” sushi menu, even though we know that’s a popular choice among some diners. 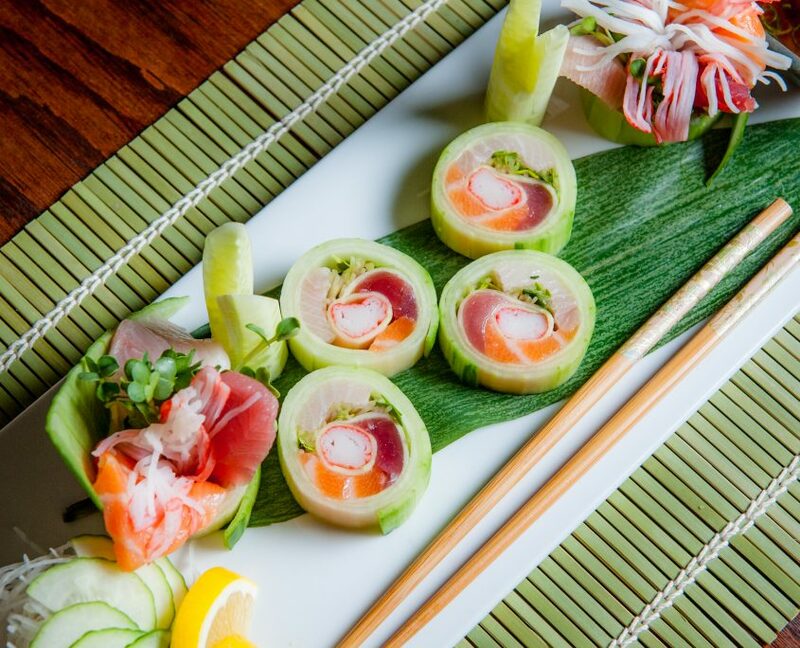 We brought the first Japanese food to Las Vegas back in 1967 and we still serve an extensive, authentic Japanese menu. We make more sushi in Vegas than just about anyone, catering sushi for many local events as well as providing quality sushi to casino-resort buffets and restaurants. 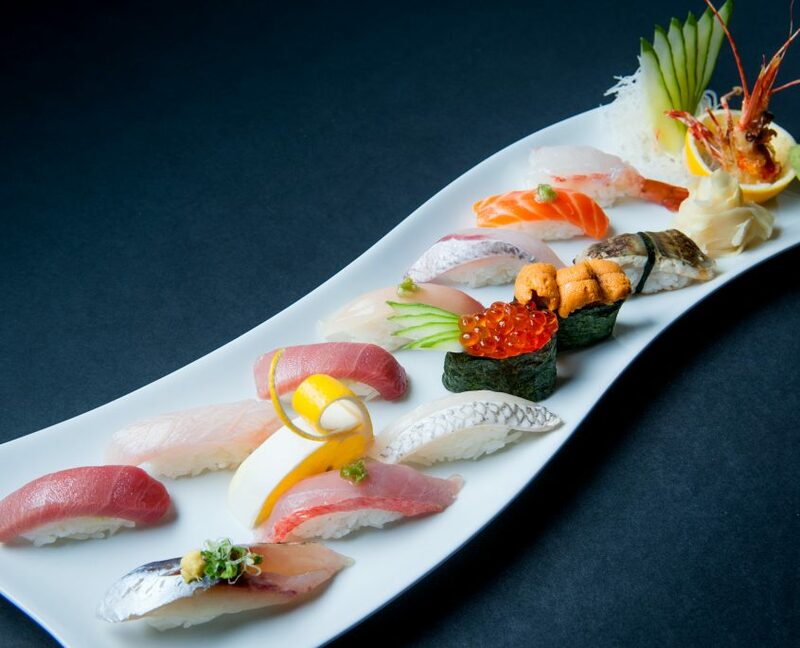 And of course, we serve a wide selection of top quality fresh sushi in our own restaurants in Las Vegas and Henderson. So what gives? Why don’t we also offer “all you can eat” sushi, too? 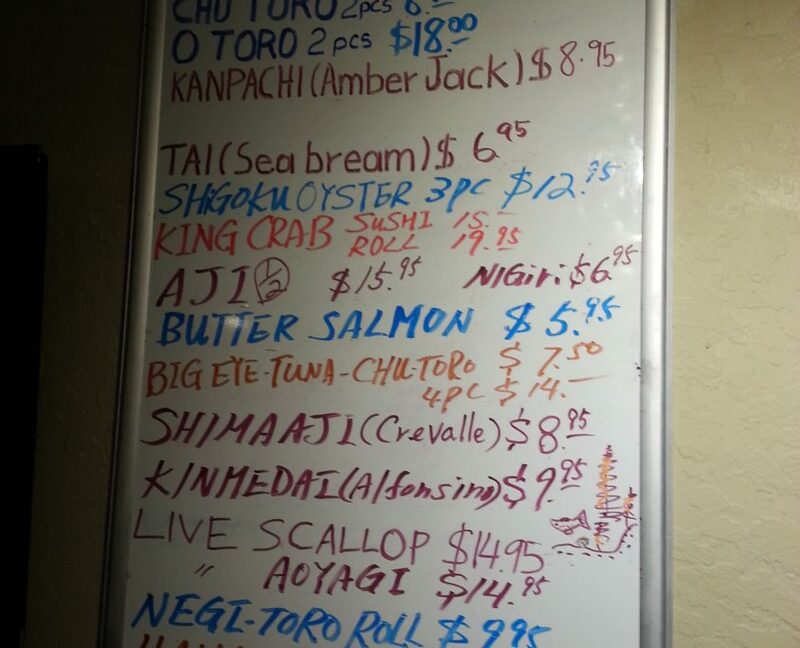 Osaka is proud to serve the freshest fish in Las Vegas. 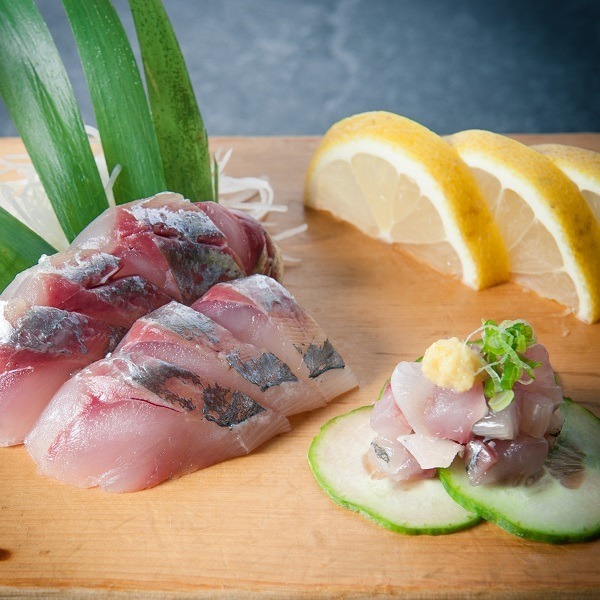 We have cultivated and developed relationships that bring us the best selection of fish from Japan, including seasonal delicacies and hard-to-find varieties. We take pride in using only fresh caught fish in our sushi, delivering rich, fresh taste and quality that set Osaka apart from the rest. On the other hand, an all-you-can-eat sushi restaurant requires purchasing fish in bulk and then freezing it to have large quantities available for producing less costly and faster sushi plates. Once frozen, fish loses its delicate, fresh texture and taste. And, research shows that besides affecting the texture, freezing can also increase the bacterial content of the fish, which, if followed by improper handling, can lead to illness. When fish is frozen, it loses water and most of the soluble minerals and vitamins. Compromising quality for quantity is not in our DNA, so we stick with the best fish available and prepare it fresh at its peak. If that means serving less sushi, then we are ok with that. Our customers agree and return again and again, excited to see what fresh, new taste might be available each time they visit. All you can eat establishments use the whole fish to be able to produce large quantities of sushi at a minimal cost. It is no secret that customers tend to eat or order more of all-you-can-eat, yet the price is usually held to a reasonable level to attract new customers. Since the cost of doing business is important for any establishment, low price and high volume make it necessary for the restaurant to find ways to save money on the ingredients it uses. At Osaka, our expert, our trained sushi staff carefully select the best cuts of fish in order to deliver the highest quality and consistently perfect sushi to the taste of our discriminating clientele. We have many regular customers who know sushi well and can attest to the quality of the sushi platters served to them. They have their favorite dishes and know they will get the same high quality dish every time they order it. Osaka prefers to stay one cut above and not have to compromise on the quality of the fish we use. Osaka’s sushi bar is the home of variety and rare dishes. Its menu reflects the restaurant’s focus on offering its clients not just the freshest, but also hard to get, fish species. Osaka’s ability to find and prepare the most interesting and new varieties of sushi has made it home to many local and visiting sushi connoisseurs. 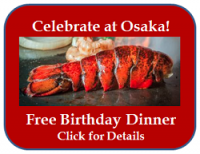 Specializing in seasonal varieties and testing new flavors and recipes doesn’t work well in an all you can eat situation, so you won’t find all you can eat specials at Osaka. Instead, at Osaka, we pride ourselves on our wide and changing menu of sushi, as well as other traditional Japanese dishes. Most all-you-can-eat sushi restaurants settle for a fixed menu that is inexpensive, fast and easy to prepare. That is not our style at all. Some fish species are so rare and hard to find that their price will be higher, and we do pass that along to our customers. But these savvy customers know an extraordinary sushi-eating experience, and they are happy to pay a little more for excellence and the chance to taste a rarely available delicacy prepared by Japan-trained sushi masters. 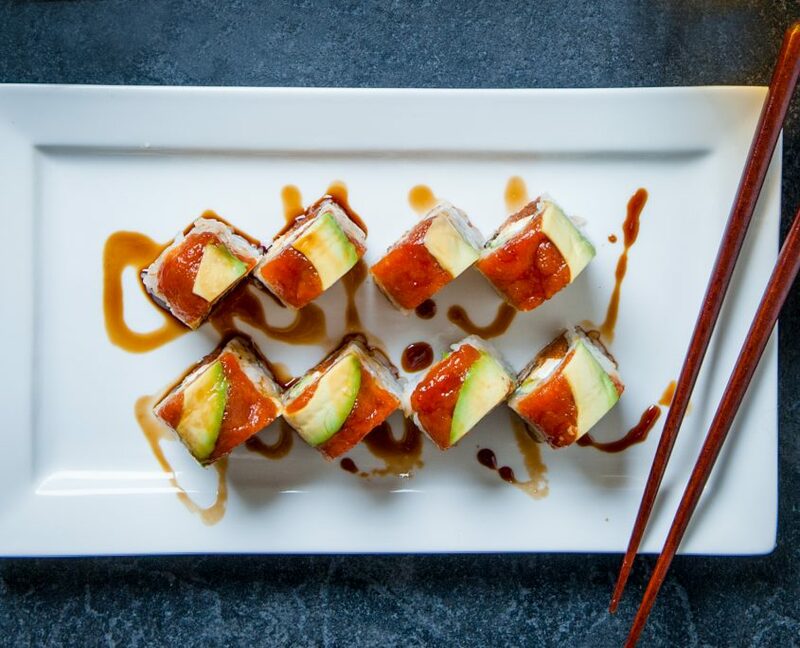 Besides variety, Osaka prides itself on making authentic, high quality sushi, that we think is the tastiest, freshest and the best sushi in Las Vegas. Our sushi chefs are trained in Japan, and have years of training and practice. Along with their knowledge of preparing fresh sushi to the highest standards, they have a flair for creativity, style and presentation. Osaka takes pride in its skill at the best sushi-making methods and recipes, and passes this along as a great sushi-eating experience for all its restaurant customers and in its sushi catering business as well. But this high quality and careful preparation means no corners can be cut, making ours an unsuitable place for all you can eat sushi. A complete focus on quality is why Osaka does not serve all-you-can-eat sushi. Altering selection, ingredients or preparation to accommodate the needs of an all-you-can-eat menu in our opinion is a compromise of quality, taste, and presentation of the food. Our sushi chefs esteem their customers too highly to serve pre-made foods or ones that compromise quality over quantity. 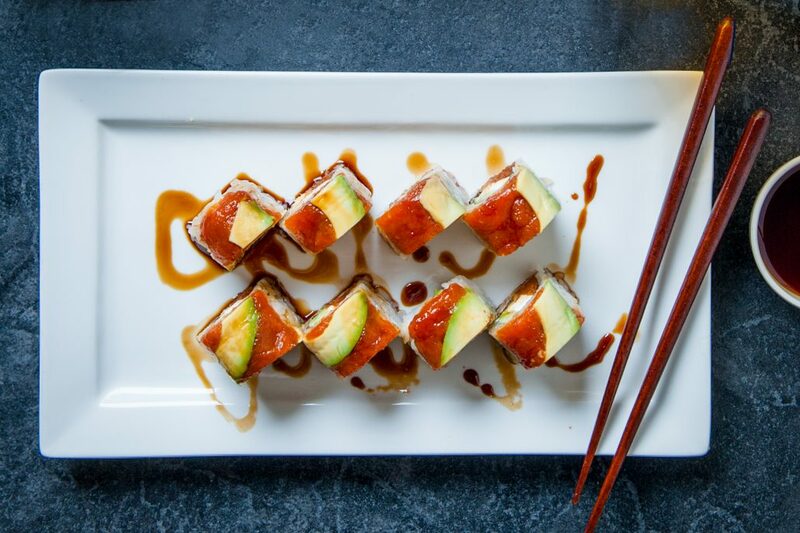 We serve only fresh sushi at our restaurants, made to order for each individual customer, just as our founders did years ago, and we take pride in doing so. 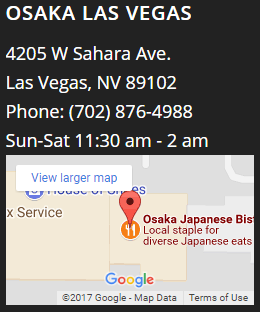 Osaka Japanese Bistro is an award winning, family-owned Japanese restaurant in Las Vegas that is well loved among local Las Vegans and tourists alike. Not a few local dignitaries, celebrities and entertainers have made Osaka their night-time spot for a great meal and a good time over the years. Our tasty sushi menu features regular flavors and seasonal delicacies with a selection of sushi rolls, mouth-watering nigiri and fresh sashimi. You won’t find all you can eat, but you can eat all you want at our friendly sushi bar, or enjoy sushi as a complement to your meal at a table or in a traditional tatami room. 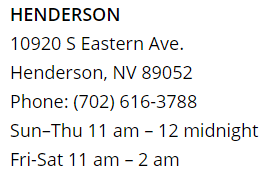 Stop by either of our two locations, the original Osaka Japanese Bistro on Sahara Avenue off the Las Vegas Strip or visit Osaka Henderson in Green Valley and taste the difference for yourself.